As some of my friends and family are aware, we are in the process of purchasing a house in the town where I work. I am incredibly excited about not having a 20+ minute drive each way to and from work. Despite the worries about being an owner instead of a renter (i.e. having to deal with the tree in you living room at 3 am yourself), I am also looking forward to having a house that is mine. To paint, to plant, to whatever however I want. Well, I will have to take Steve's tastes into account. We have passed all the major foreseeable roadblocks (pre-approval, inspection, appraisal), and so I feel secure in posting pictures of the house here. We close on June 19th. By the way, where did May go to? 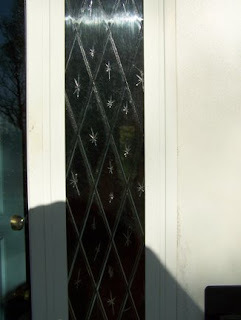 The front door - Steve loves the "atomic" style of the 1950's and 60's, so he was really excited about this detail of the front screen door. There is also a great shed in the back, built by the previous owner. It has electricity. In my dreamworld it becomes a dye-studio with electricity provided by wind or solar. I want to put a window or two in the side (Steve is unaware of this). It is painted to match the house and the inspector was really impressed with its quality. In fact, overall the house is in really good shape. 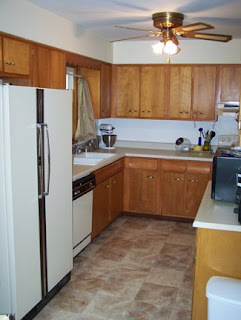 The kitchen - love the wood cabinets, all appliances are staying. Hooray! Most of the other rooms are pretty unremarkable - nice wood floors, white walls. All decent size. There are three bedrooms and 1.5 bathrooms. The dining area is small. Also, all the windows are new energy-effecient, easy-to-clean windows. After living in the draftiest house in Independence, this will be wonderful. Seriously, in the winter their is a breeze from our bedroom window strong enough to ruffle your hair. We kept our heat 0n around 62-65 all winter to prevent wasting too much energy. So not only should we see a major savings on gasoline, but on energy costs as well. 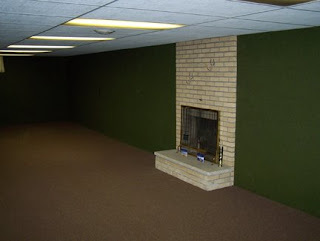 Another aspect of the house we love is the basement - I see great potential here. Love the fireplace, the finished portion is about 2/3 the width of the house and runs its entire length. Oh - and that is not paint on the walls but some kind of ??? acoustical fabric, carpet? It sounds weird, but it looks pretty cool. 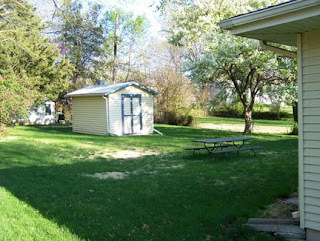 I really want to turn this into a multi-use party spot. One area for dining, another for sitting. The other really nice thing about this house is the neighborhood. We actually saw some houses I personally liked better, but the neighborhoods were not as nice. 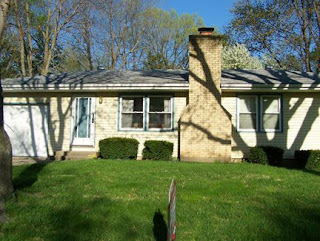 We will be in walking distance of grocery, post-office, library, and community center. There is also a greenways trail down the road. I think it will be too far to walk to school, but I will try it just once to see. Biking may be an option. But driving will only take me about 7 minutes, shorter if I find a way that does not involve so many stoplights. So - hopefully this time next month we will be moved in! Wouldn’t it be great to have a professional designer remodel your kitchen with high quality, solid wood cabinets without paying tens of thousands of dollars?